Sadie's Soulful Southern Experience brought home the award for Best Soul Food at the 2009 Hoodie Awards held over the weekend at Mandalay Bay Resort and Casino in Las Vegas. 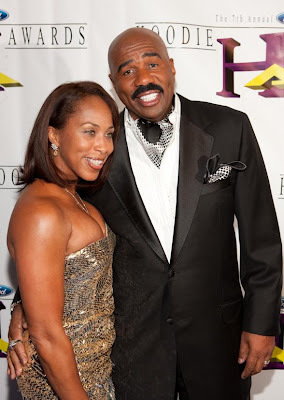 The awards, which were created by radio personality/comedian/actor/author Steve Harvey, are in their seventh year. 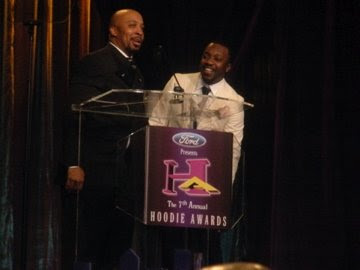 The Hoodies recognize small businesses and community leaders from neighborhoods around the country with categories like best car wash, soul food, nail shop, barbershop, fried chicken, high school teacher, beauty salon, church choir, and community leader. There's only one winner chosen nationally for each category. A Charlotte restaurant has won Best Soul Food three years in a row--Sadie's won this year and in 2008, while La'Wan's Soul Food brought home the award in 2007. This year Sadie's beat out the other finalists: Delta’s in New Brunswick, New Jersey; Mama Nems’ in Orlando, Florida; and Bite Your Tongue Cajun Restaurant, which is also located in Charlotte (relocating here from New Orleans after Hurricane Katrina). Plenty of Charlotteans were on hand for the weekend celebration in Las Vegas, including Q92.7's Chirl Girl; Damian and Jermaine Johnson, owners of the No Grease Barbershop chain; and singer Anthony Hamilton, who was an award presenter (pictured below with Nephew Tommy). There were lots of other celebrities in attendance--many as performers and presenters--such as Terrence J and Rocsi, Sherri Shepard, Mo'Nique, Jazmine Sullivan, Tyler Perry, and, of course, Steve Harvey and his wife Marjorie (pictured below). Sadie's Soulful Southern Experience is located at 5708 North Sharon Amity Road. Visit www.sadiesoul.com for more info. Click here for the full list of Hoodie Award winners.